I don't know about you, but I love to entertain - especially around the holidays. The one wild card: kids. How do you keep them entertained and seated for more than 5 minutes, so the adults can enjoy a conversation, a drink or even a meal (oh, the luxury of it all!)? After lots of trial and error, here is the formula I've come to know, trust and love. Take the worry out of kids destroying the table by covering it with kraft paper, which can be found almost anywhere these days, or on sites like Office Depot. Not only does it set me (as the hostess) at ease, but it provides serious entertainment for the kids. I've left it completely free with only washable (if they're not washable, this moms not buying them) markers or sometimes I jump start their coloring with a couple outlined shapes - both work and the kids love it! Here, I outlined the shape of a placemat and asked the kids to create their own design. I also outlined several leaves, from the yard, to give them a head start. 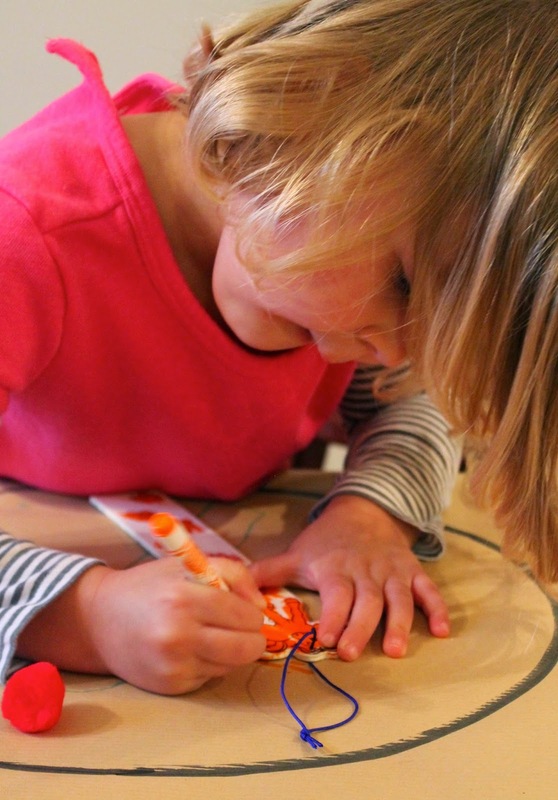 Beyond coloring, I like to include an easy craft that the kids can make on their own. 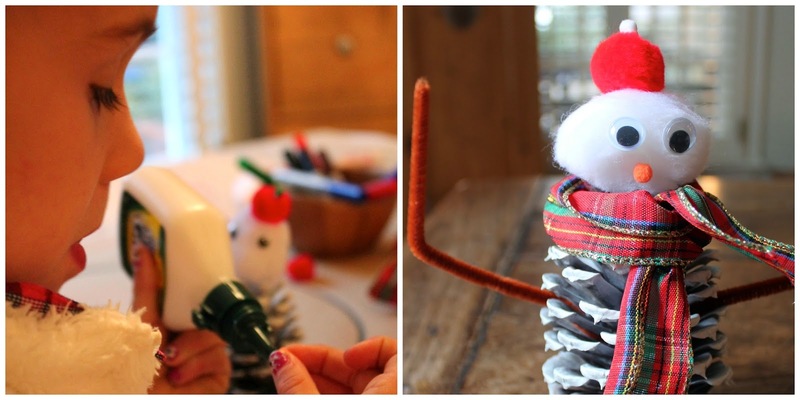 Check out these cute snowmen made from pinecones we found in the yard. (I'll post the how to later this week.) I made one to give the kids an idea of how they could look, but they definitely got creative on their own. If crafting isn't your thing, no worries, stores like Michael's have you covered. They have a variety of inexpensive craft kits that come with everything - just open the box and your kids are away! Promise. Just don't forget the washable glue. 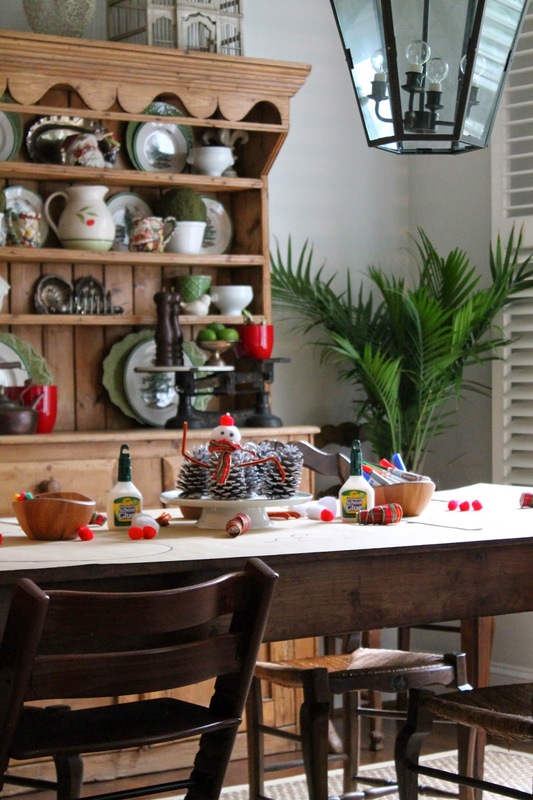 Now that the table is covered and the kids are entertained, it's time to focus on setting a kid friendly table. Personally, I don't want to worry about things getting broken - but I still want it to look nice. That means no paper plates for this girl, it is the holiday season after all! Melamine plates are my favorite. Here, I've used standard white plates, but I love the customizable plates (and mugs!) available from Shutterfly. Add an initial, a custom pattern, a saying or even an image - so many possibilities, I can only dream of how cute the table could look! Definitely going on my Christmas list this year. Another tip for table setting: I love using old jam jars as drinking glasses. Reduce, reuse, recycle - right!?!? These are my favorites. They aren't precious, can be easily replaced (we get through a jar of jam every couple of weeks around here!) and they look cute too. Bonus. It's no secret kids can be super picky when it comes to eating, mine especially! Wracking your brain trying to find something to please everyone, can be super stressful. After all, nothing can ruin a get together faster than an unhappy toddler! Trust me, I've been there. My rule: try including 3 things that most kids love and chances are they'll eat at least one. Some of my go-to's are: turkey chili, tomato soup, any kind of fruit, sliced veggies with dippy and of course, caramel brittle ice cream. Entertaining is so much more fun when everyone is relaxed and enjoying themselves, kids and hostess included. So go on, get out there and have some families over this holiday season! Happy entertaining.